SWEEEEEEEEEP! Now Let's Not Get Swept, Please. The O’s finished off a three-game sweep of the Oakland Athletics last night with a 3-2 victory. It was a nice little payback to Oakland, who did the same to us a few series back. The sweep was the O’s first over the A’s since 2005, and their first in Baltimore since 1998. This little O’s fan Boh sweeping man will now be the third that shows up if you scroll down the front of this site, which would seem to indicate that the O’s are having a pretty fine season. 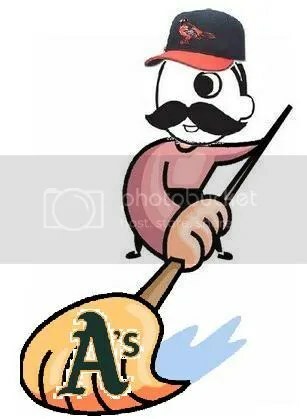 Unfortunately, after the previous sweeps of Seattle and Kansas City, our boys immediately hit the skids, losing five of the next seven, then five in a row, respectively. With Tampa bringing Jeremy Hellickson and David Price both to the mound this weekend, the sense of optimism in Birdland following this latest sweep is extremely guarded, to say the least. As a result of rest of the American League East scuffling, the Birds find themselves just 5.5 games out of first place at 29-31. Another extended losing streak will likely push that number into the double digits though. So come on, O’s. Build off the momentum this time, instead of immediately giving it all back. This entry was posted on June 9, 2011 at 9:09 am and is filed under Orioles. You can follow any responses to this entry through the RSS 2.0 feed. You can skip to the end and leave a response. Pinging is currently not allowed.